Preparing for the 2010 ING New York City Marathon on Nov. 7, Subway spokesman Jared Fogle sought out some much-needed training advice for completing the grueling 26.2-mile course. 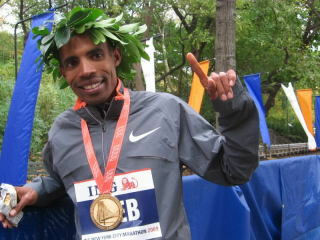 Who better to ask than ’09 NYC Marathon winner and world-class U.S. distance runner Meb Keflezighi? In the video below, Keflezighi shares how he’s preparing to defend his NYC Marathon title. Be sure to check out the Subway-sponsored training session with Meb Keflezighi and Jared Fogle at the Subway play hard. eat fresh. Channel on STACK TV. I often like to compare current workouts with workouts from prior years to help me evaluate my fitness. I still use the same workout log sheets I used in high school to enter my workouts. These workout logs have been a great asset to me and Coach Larsen (who keeps his own notes on my workouts). Recently they also came in handy as I was writing my book “Run To Overcome,” (www.RunToOvercom.com ( to be released on Nov. 1). For today’s post, I wanted to share my race splits for the Rock N Roll San Jose Half Marathon, and compare them to my splits from last year. It has been a tough road back for me since my 5th place finish at the Boston Marathon. Going into the race I didn’t have a perfect training buildup or a tune up race. As you may recall, I didn’t have any races between last year’s New York City Marathon and the Boston Marathon this spring. I recovered quickly and well after the New York City Marathon victory. I was getting in shape very quickly for the Boston Marathon. I had a few setbacks during the Boston Marathon build up, and at a critical time. It was right in the middle part of my build-up. Some people thought I was too busy making appearances to train for Boston, but that couldn’t be farther from the truth. I was committed to end the streak of non-American winners at the Boston Marathon, and was glad that Ryan Hall and I were both given the opportunity by John Hancock. I would like to start by giving thanks to God for the many Blessings bestowed in my life. I reflect daily on my life as a young boy in Eritrea living with no electricity, and barely the necessities like food and water. These thoughts often come to my mind and I am reminded daily how blessed my family and I are to have the life we have today. There are so many people who have sowed seeds in my life and for those people I am so thankful! understand that in life, things won’t be perfect every day, 365 days a year. days, weeks, months, or years will bring. Can I hold the peak fitness that I experienced in early and mid October for the ING New York City Marathon on Nov. 1? I knew I was ready to roll four weeks before the New York City Marathon. However, I tried to keep the momentum from the encouraging performance at the Rock ‘N Roll San Jose Half Marathon going for as long as possible. I just needed to keep healthy and do the minimum for the last three weeks because I knew I was fit. Well, now that the race is over, we can say the training was right on.